There you are, Average Joe private pilot, maybe 300 hours, a decent stick at the controls of a Skyhawk. You're cruising back in coach on a Boeing 767-400 owned by XYZ Airlines at FL380 over one of the square states between the Rockies and the Appalachian Trail. Somewhere about Omaha, the flight attendant comes running down the aisle screaming "My GOD, both pilots have had simultaneous heart attacks...we're ALL GOING TO DIE!" You look around, and notice the other pax are freaking out, so you proudly raise up your hand and tell her you're a pilot, and you THINK you can safely land the plane. The passengers cheer as you rush forward to the cockpit door. After dragging the Captain and FO out to the galley, you slip into the left seat, and the pressure mounts. But wait, this is just an airplane, they all fly pretty much the same - at least that's what you are TELLING yourself. You find a radio, dial up 121.5 and inform the nice ATC voice in the sweet airline headset that you have an emergency. 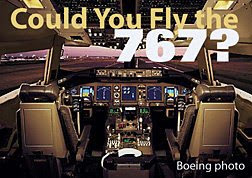 You ask them for two speeds, the approach speed of a 767 and the dirty stall speed. You burn that stall speed into your brain, knowing that like the 172 back home, as long as you are moving through air faster than that critical number, this beast of a flying machine will still...FLY. Once you know these speeds, it's all like driving the Cessna, you tell yourself. Throttle back, trim nose up, the thing slows down and the houses get bigger. Three in the green – you know that from riding with your buddies who own Bonanzas – now just where IS that gear lever anyway? ATC gives you vectors to the largest airport around, and after a smooth descent, you trim for approach speed, steer to the runway and drive it onto the numbers like you've done it a million times. The cattle in back roars even though the "arrival" is torturous on the landing gear, and as you exit the jetway, the waiting paparazzi is a mob and soon your mug is plastered on the cover of every magazine in the land as this week's flying hero. After appearances on Leno, GMA and Ellen, you sign a lucrative book and movie deal and retire as a gazillionaire to a small island near Fiji. An Air Canada co-pilot having a mental breakdown had to be forcibly removed from the cockpit, restrained and sedated, and a stewardess with flying skills helped the pilot safely make an emergency landing, an Irish investigation concluded Wednesday. None of the 146 passengers or other nine crew members on board the Boeing 767 bound from Toronto to London was injured after the 58-year-old co-pilot had to be removed by attendants and sedated by two doctors on board. The pilot then asked flight attendants to find out if any passenger was a qualified pilot. When none was found, one stewardess admitted she held a current commercial pilot's license but said her license for reading cockpit instruments had expired. So the flight attendant – current with her commercial but not current on her IFR ticket – slipped into the right seat and helped the Captain bring the -67 home safely. This just goes to show how cool having your pilot's license really is...you never know when you are going to be called upon to save the day. And if nothing else, it will certainly come in handy to poke holes in the sky while chasing hamburgers across the countryside.